Schools of Instruction are well under way and many Grangers have expressed their concern as to the feasibility of securing one new member per month per Grange. I, with extreme confidence, tell you it is realistic and obtainable; if we want it to be. Brothers and Sisters we cannot wait any longer to seriously address the need for membership gains in every Grange in Connecticut. Our future relies on continual membership development, growth and sustainability. The only way this is possible is if we go back to the basics. A Community Grange MUST hold at least one legal meeting per month with a quorum of a minimum of 7 members, there are no exceptions. No quorum, no business can be transacted. This is clearly covered in the Digest; it is important all Grange Leaders familiarize themselves with the Digest, which is available at no cost on the National Grange website if you download a copy, or you can purchase a printed copy from the National Grange directly. 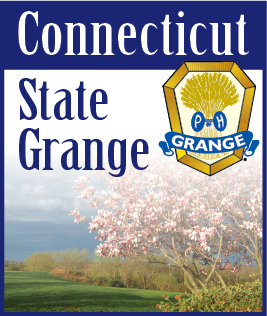 Your Deputy Staff is familiar with the contents of the Digest and will be working with each Grange to ensure you are moving forward in accordance with the Digest and Connecticut State Grange policies. All Granges are to be meeting in proper form; that means if you meet in a hall it needs to be properly set. If you are unable to meet in your hall the Digest again outlines what is needed in these cases. I am concerned by Granges that are meeting more frequently in members houses. I understand it is currently for necessity in some isolated circumstances, but when this happens, visitors cannot visit, new members may not feel comfortable and proper procedures are not being followed. This is not acceptable on a continual basis. Every Grange needs to make every effort to conduct their business meeting as prescribed in the Digest and Manual. Whether you use the traditional Manual, Alternative Manual or an approved Action Grange opening and closing, when done appropriately it is meaningful and efficient. When guests visit our Grange, our ritual when done well, impresses them, it does not “scare” them off. It is ALL of our responsibility as Grange members, not just Officers to make sure we are able to conduct all business to the best of our ability. I know we are proud of our heritage, whenever there is a resolution presented to change our ritual, it usually is voted down overwhelmingly. Brothers and Sisters, I commend each of you for your conviction to the preservation of our ritual, as it is as poignant today as it was the day it was written. But we cannot have it both ways; we cannot defend the preservation of the ritual and then not ensure its proper use and exemplification. It does not and cannot work that way. What we are saying is we expect every other Grange in Connecticut and the Nation to adhere to the written ritual, but we don’t have to. If we are adamant to preserve our ritual, we had better be able to support that decision by exemplifying it to our best ability at every meeting every month. I am committed to preserving our ritual; I have informed each Deputy they are expected to receive their Code Reading Card within the next two years. I feel it is important to understand and read the Code Book as it “fills in the gaps” of the manual. I challenge each Leader of each Community and Pomona Grange to commit to memory your part in the Opening and Closing, thus proving your support of the preservation of our ritual. You can do it, I know you can, all you have to do is believe in yourself and do it. Now, let’s address the reoccurring comment on visitations. I agree with each and every member that is concerned no one visits “like they used to.” I will let you know now, I have informed the elected and appointed Officers of the Connecticut State Grange they ARE expected to visit, and visit regularly. There is NO formal visitation schedule for State Officers, yet. I encourage and Challenge all Pomona and Community Grange Officers and members to visit as well, as often as you can. I encourage Granges to invite members and the public into your Granges. Remember Neighbors Nights? Exchange Programs? I do, and we do not do enough of these programs anymore. In my visitations someone always mentions something they used to do. Plays, skits, dinner programs, the list go on. Why don’t we still do those? We can! We have nothing limiting us, nothing holding us back. Why not join forces with another Grange, another organization, how about your local schools drama department. All we have to do is want to do it and we will find a way to make it happen. I know this has been rather to the point, but I felt it was necessary, I feel all of the above have been excuses we have made for ourselves to justify our current conditions. I do not believe that is where any of us want to be, I don’t believe it is where we will stay. I know we all want the best for our Grange and are willing to do whatever it takes to make it stronger, more visible, and more relevant. You know how I know this, because I believe in each and every member of the Grange, and the Spirit, Drive and Determination of each member will carry us to that next level. I truly thank every Grange Leader and member for their time and effort; it does not go unnoticed or unappreciated.